e-Poster - Self Care - Because it Matters! 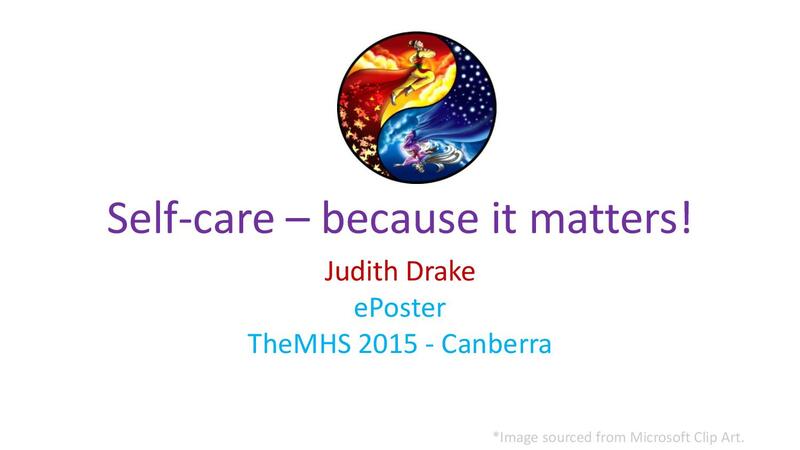 - TheMHS Learning Network Inc.
e-Poster – Self Care – Because it Matters! Abstract: This e-Poster has been singled out for a special commendation on the basis of it's creativity and delivery of message. Chances are, if you're someone who neglects your own self-care, you're not likely to choose - from the plethora of presentations on offer at TheMHS - to go to a presentation or workshop about, well, self-care. So this poster is aimed at everyone, but especially those who are just too busy to worry about or prioritise their own needs and well-being. Previous PostSession Resources S032: "Good practice disclosure strategies for jobseekers: A pilot study of a strengths-based disclosure framework highlights benefits for jobseekers and provides a model for consumer participation"
Next PostKeynote PowerPoint: "Community Based Mental Health Interventions - The National Empowerment Project"